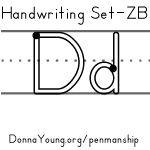 2-Stroke D, 1-Stroke D : Capital D can be written with no pencil lifts or with 1 (1 strokes or 2 strokes). I am providing both because I don't know which one you will prefer. The animations are un-intimidating and hand-drawn. I made 2 animations each for lowercase "d" and uppercase "D"—one with a pencil lift and one with no pencil lift.